OK, I bet that everyone has seen the "Coexist" bumper sticker by now - the one that promotes peaceful coexistence among different religious groups. But what is the story with the spoof sticker (top image)? A link of sausage, guns, a cigarette, and is that the Safeway grocery store logo??? All comments and explanations are welcome! 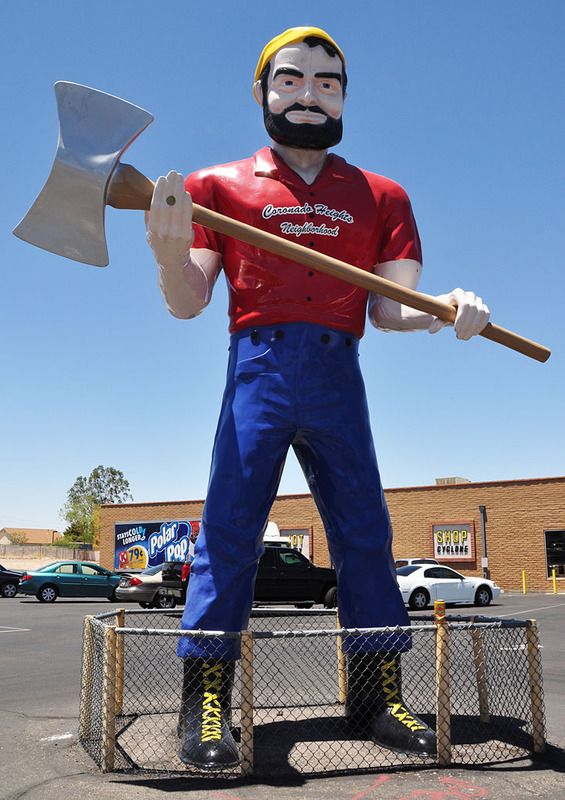 Did you know that Tucson has not just ONE but TWO lumberjacks? The one most people know is the Coronado Heights mascot on Glenn and Stone. But there is also one further west whose name is Big Ed. 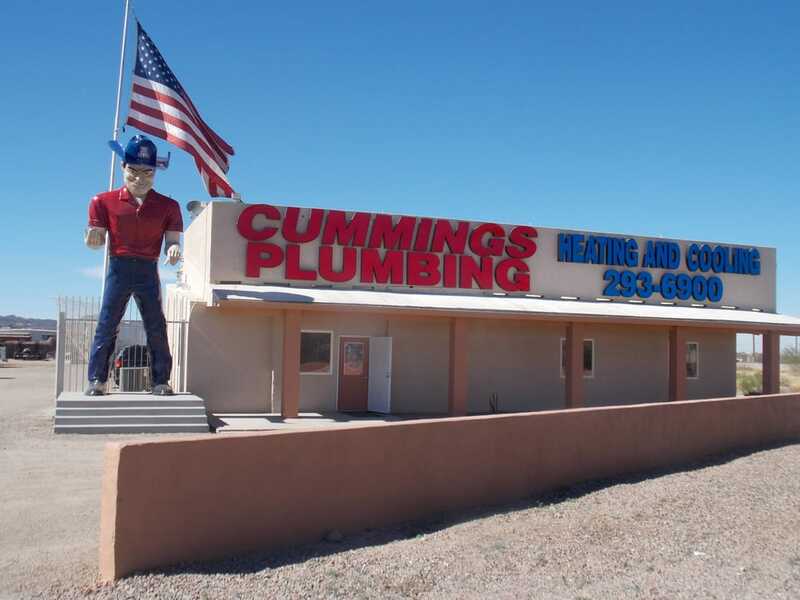 He is the mascot for Cummings Plumbing. Fun! OK - not a single guess! The answer is Wildflower on Oracle. 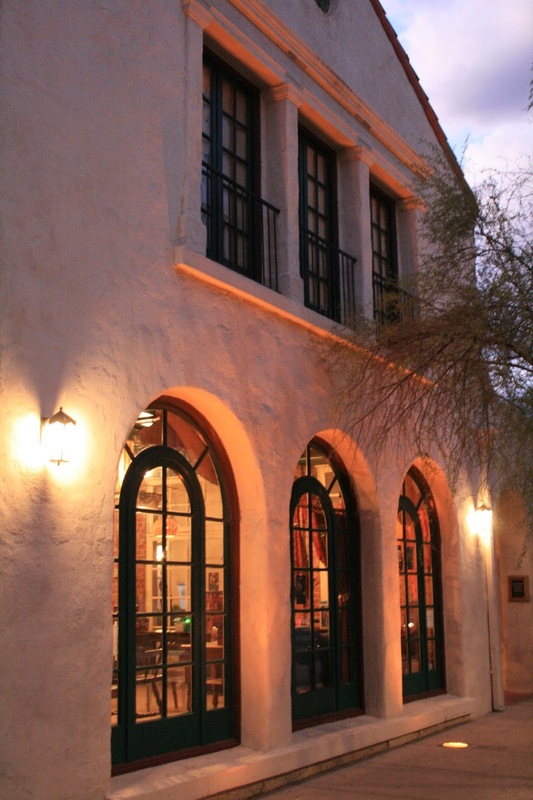 One of Tucson's best restaurants! Day 2: Wow - not a single guess so far! OK - this bar is in a restaurant that is north of River Road and west of 1st Avenue. Let's wind down the week with a contest! 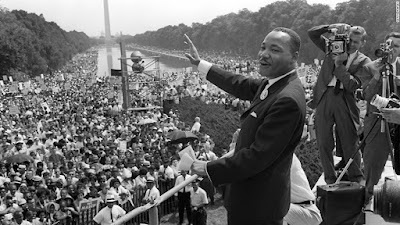 Regulars to the site know that whomever is the first to post the correct answer to "Where is this?" wins a "fabulous" TDP t-shirt! Start your engines and post your best guess! Good luck! There is no one in Tucson unaffected by Saturday's events. Here is a glimpse of the public outpouring of emotion displayed in front of Gabby Giffords' Tucson headquarters. Hundreds of candles and flowers perfume the air; dozens of handwritten signs beg for peace and healing for the victims and their families. This constant vigil is just one site established for prayer during this difficult time. Tonight there will be a "Healing of our Community" mass at 7pm at St Odilia Church (7570 N Paseo del Norte). A permanent memorial of the January 8, 2011 event will be built downtown. Here is more info as well as photos and a video of the dedication. Today we come to the end of a whirlwind 15-Day Alphabet Tour of MY FAVORITE THINGS in Tucson. If you have not been following along, let me explain. Each day has highlighted a Tucson treasure while being guided by the letters in MY FAVORITE THINGS. 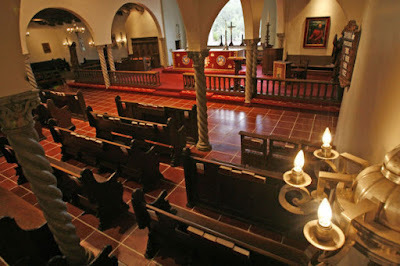 Today we wrap up the tour with a Tucson treasure that starts with the letter S - St Philip's Church at River & Campbell. This beautiful building was designed in the 1930's by Josias Joesler, one of Tucson's most famous architects. This Episcopal church is known for its outreach and its inclusion. The church's grounds are serene and offer many welcoming areas to enjoy a contemplative and refreshing moment. What is YOUR favorite thing/place in Tucson that starts with an S? Tell us! I hope you enjoyed your tour around town these past 15 days. What did you like best? We have been on an Alphabet Tour of Tucson using the letters of MY FAVORITE THINGS to spotlight some of Tucson's greatest and most fun places and things. On Day 14 of our tour we have landed on the letter G which brings us to a true Tucson treasure - the Gaslight Theatre. The Lone Stranger is the next spoof scheduled. The shows sell out fast so call for tickets soon if you want to see this one. What is your favorite Tucson thing/place that begins with a G? Tell us! To fulfill the 15-day Alphabet Tour of MY FAVORITE THINGS in Tucson, we are now at the letter N and I decided to highlight a Neighborhood. 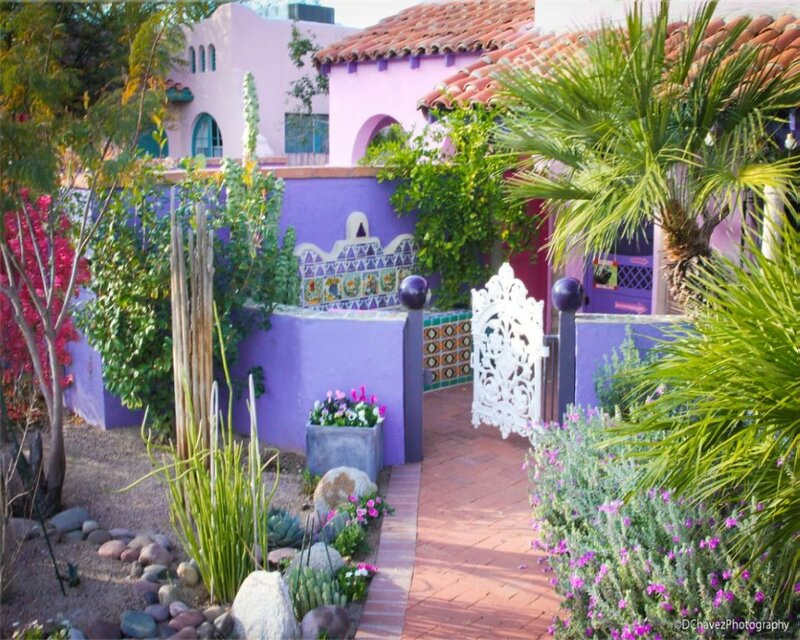 Tucson has many interesting Neighborhoods with styles and vibes of their own. 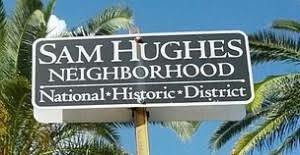 One of the most charming areas of town is a small area east of Campbell that has been designated a National Historic District - the Sam Hughes Neighborhood. Every two years the residents organize a very popular and well attended House Tour. To learn more about this beautiful and historic neighborhood, click here. 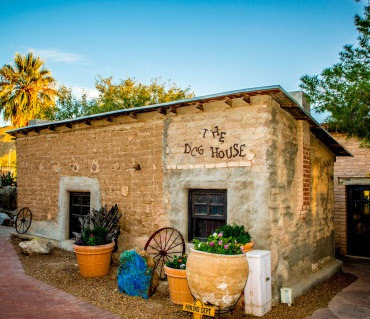 What is YOUR favorite Tucson neighborhood? Tell us! As we continue our virtual Alphabet Tour of Tucson we have arrived at Day 13 of showcasing great Tucson things using the letters of MY FAVORITE THINGS. This brings us to Tucson things and places that begin with the letter I. How about this fantastic neon sign as a classic Tucson Icon? This sign was installed about 8 years ago in the Miracle Mile neighborhood and serves as an old fashioned "Welcome" sign. What is your favorite Tucson Icon? Tell us! We are glad you have joined us for our Alphabet Tour of Tucson with the letters that spell MY FAVORITE THINGS. 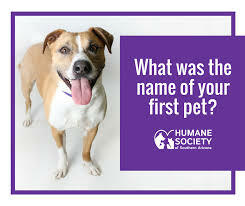 Already we are on Day 12 and looking at great things in Tucson that begin with the letter H.
If you don't know about the Humane Society of Southern Arizona, let me fill you in! They are supported ENTIRELY by local funding - no national funding is helping them accomplish all that they do for animals. And they are currently in the midst of a capital campaign to build a wonderful new home. If you are inclined to help them reach their goal, go to their website to quickly and safely donate. Every dollar is appreciated! What is your favorite Tucson thing/place that starts with the letter H? Tell us! If you have recently been on the site you know that we are taking a virtual Alphabet Tour to showcase some of Tucson's greatest things and places using MY FAVORITE THINGS as the guide. 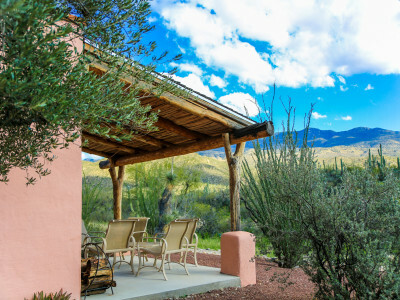 Today is Day 11 and we are on the letter T. Tanque Verde Guest Ranch offers a true dude ranch experience and combines rustic Western-style charm with comfort. Even if you are not a guest there you can enjoy the restaurant and the Dog House Saloon. This is the West at its best! What is your favorite Tucson thing/place that starts with the letter T? Tell us! 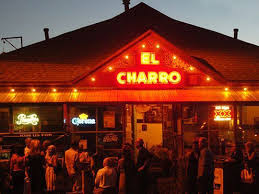 As we continue on our virtual tour of Tucson's greatest places and things, we have selected this wonderful event to represent the letter E in our Alphabet Tour of MY FAVORITE THINGS. 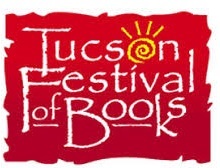 This is Day 10 of our celebration and the featured Event is the wonderful, amazing, huge Tucson Festival of Books that takes place every spring. Authors come from all over the world and do talks and workshops, local nonprofits showcase their services, and the campus mall is covered for as far as the eye can see with white tents that showcase books, literacy, writing, books, reading, and more books! What is YOUR favorite Tucson event? Gem Show? Rodeo? Tell us! Recently we have been taking a virtual Alphabet Tour of Tucson and today is Day 9 as we spell out MY FAVORITE THINGS in Tucson. We are showcasing the great things in Tucson that begin with the letter T.
This is the elegant Tucson Temple of Music and Art, the Tucson home of the Arizona Theatre Company. Not only is this space historic and charming, the engineers got the acoustics right - unlike the behemoth UA Centennial Hall where you have to hope your seat is in one of the very few sweet spots! 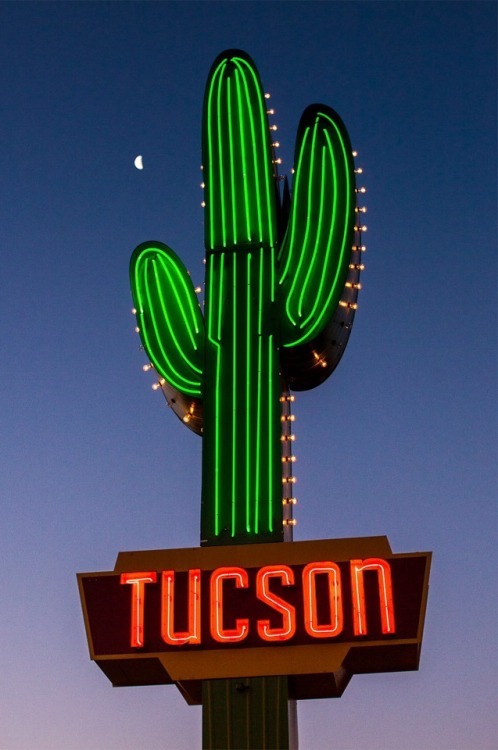 What is your favorite Tucson place that begins with the letter T? Tell us! 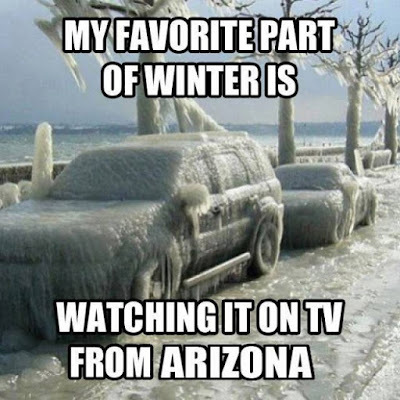 Today we are thinking about things in Tucson that begin with the letter I as we post the 8th day of MY FAVORITE THINGS about Tucson. 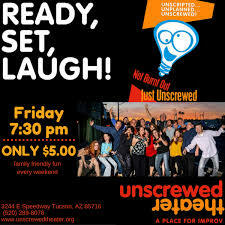 If you love Improv, you must get yourself to the great and wacky Unscrewed Theatre! The 7:30 pm show is family friendly which doesn't mean it's all Disney-esque. It just means that the show does not contain vulgarity. 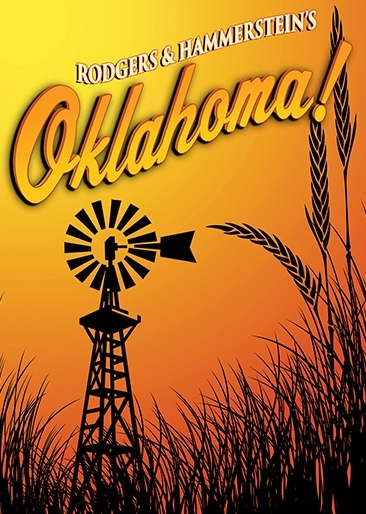 I am happy to enjoy an evening of comedy without f-bombs, aren't you? 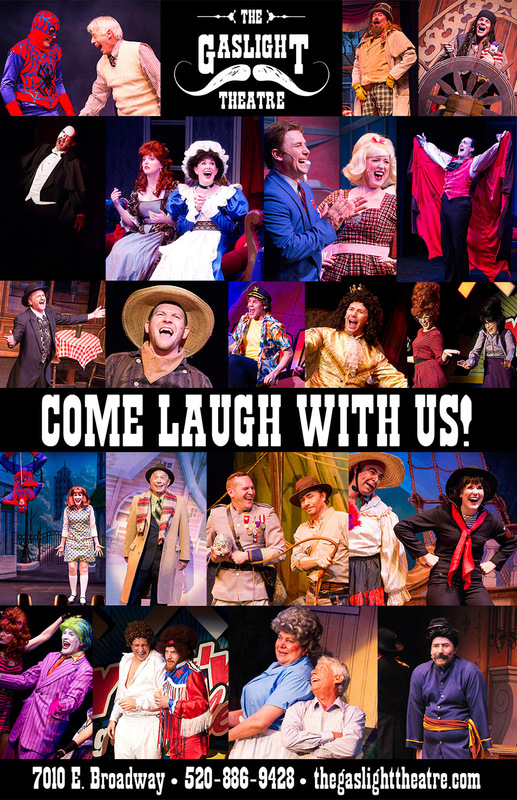 And if you want to get up on stage yourself, they do invite audience participation AND they offer classes, too! We ended the year with exploring many of Tucson's Treasures and here we are kicking off 2018 and continuing our tour. Today is Day 7 of MY FAVORITE THINGS. 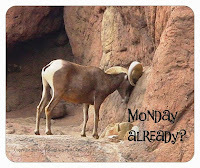 So, here we visit one of the things in Tucson that begins with R: the wonderful Reid Park Zoo. 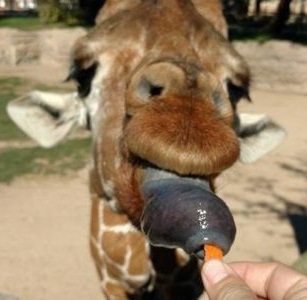 If you have never fed a carrot to a giraffe, you don't know what you are missing! And boy do they have long eyelashes! What are your favorite Tucson things that begin with R? Tell us!